The Internet exists for one purpose: Videos of people being scared by other people - or, apes. Ok...that’s not the real reason obviously. The internet actually exists to get the best, most relevant information to people searching for it. There are a few “search engines” that exist to help people find this information. Google, Yahoo, Bing, and DuckDuckGo are some of them. When you search for something using the search engine, it crawls the web (it’s actually called “spidering”) and “reads” all of the information on every website. Do they stay for a long time on the page? Do lots of other high-ranking sites linked to this one? Popularity and relevance of sites aren’t determined manually. Instead, the search engines use algorithms. These math equations are specifically designed to help the search engines page through all the websites ever, and bring up the best ones for someone searching for answers. So, how can you make sure your website is crawled for the right terms, the ones you actually want to be found for, by the prospects you care about? Start by publishing awesome content - text on pages, with images, that keep people engaged. Publish frequently and consistently.Google re-crawls new pages every week and gives priority to new content from great sources. Maybe you didn’t know, but this is how the Internet works. Following those steps and optimizing your content for the people using search engines is called Search Engine Optimization, and it’s a fundamental principle in building a digital marketing strategy. Search engine optimization, or SEO, is the practice of continuously updating the way your website and its content are put together, so that they’re easily searched and found by search engines like Google. This benefits people looking for information you happen to offer. Is SEO Useful for B2B Companies? Yes, SEO is of great benefit to B2B companies who are doing it. However, if your competitors are implementing SEO and you aren’t, you’re in trouble. Since search engines base their opinion of your site on an algorithm, and that algorithm is programmed to give priority to sites that a) provide lots of educational resources, that b) are updated frequently and c) provide value to searchers, your site will fall behind without those consistent optimization updates. From a purely lead generation perspective, SEO is paramount to your success. Research shows that those involved in the B2B buying process are already 57% of the way down the path to a decision before they'll actually perform an action on your site. In fact, search is business buyers’ #1 resource for research; “90% of B2B researchers who are online use search specifically to research business purchases,” according to Think with Google. On average, B2B researchers do 12 searches prior to engaging on a specific brand's site (downloading a piece, subscribing to a blog, using a ‘contact us’ form, etc.). About 71% start on a generic query, so they're looking for product first, not for you. That’s directly in line with the identified buyer’s journey exercise we talked about in the inbound marketing section. 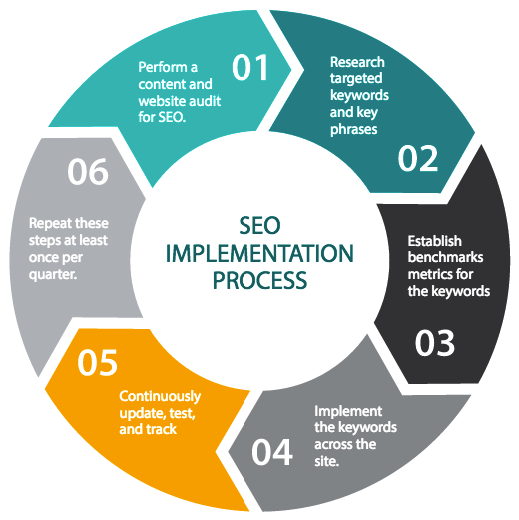 What’s the Process to Implement SEO? Perform a content and website audit for SEO. Research targeted keywords and key phrases (note: these two phrases are used interchangeably, so we’ll be using keywords moving forward to mean both). Establish benchmark metrics for the keywords. Implement the keywords across the site, in content, meta descriptions, title tags, headers, and blog posts (not too many in one place; remember, it is possible to stuff keywords and actually take a hit as a result). Continuously update, test, and track. Repeat these steps at least once per quarter. One other incredibly important thing to note about SEO is that it’s slow. Once implemented, it can take months for the changes to take effect. Have patience, and be consistent. There are more than a dozen metrics involved in determining your search engine ranking. We’ve identified the most popular and easiest to track month-over-month using a web analytics tool, or a number of other tools available for little to no cost online. These metrics will give you a good idea of how your optimized site is performing. Channel - Referral Traffic: The channel is the way a visitor gets onto your website. Referral traffic is website traffic, or visitors, that come to your site via links from another website. In SEO-speak, these are called backlinks, part of off-page SEO (not on your own page). These take longest to develop, as they require another, more highly-ranked website to take notice and link back to your site. Channel - Organic Search Traffic: Organic search visitors are the ones who look for a term using a search engine and visit your site as a result. 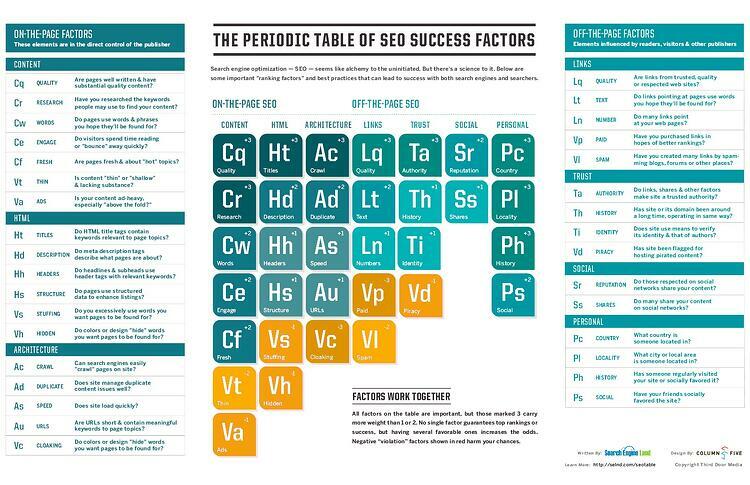 These are on-page SEO results and are a good success measurement for your keyword strategy. Ideally, these numbers will start to rise within 2 months of implementing an inbound or content marketing plan that incorporates targeted keywords. Keyword Rank: where the keyword falls on search engine results pages (typically, Google). The goal is to be on page 1 (ranked 1-10), and better yet, in the top 4 or 5 results. Search Volume: number of times a search for the exact keyword is made in a month. This number will help predict the opportunity for conversions from organic search. The higher the search volume, the harder it is to rank, but the better results you’ll see as a result of ranking highly on those SERPs (search engine results pages). When choosing keywords, target a good mix of both high (100+) and low (-25) search volume phrases. CTR Opportunity: Rand Fishkin of Moz defines this as knowing “what other features are in the search results — images, news boxes, ads, videos up at the top, instant answers, knowledge graph on the right-hand side that's going to draw clicks away from my potential to get searchers to click on my result.” It keeps a B2B company from focusing on keywords that otherwise look like great potential targets, but in reality won’t garner many conversions. Difficulty Rating: This rate states how hard it will be to rank in organic results. The lower the number, the easier it is to rank against your competitors. The rating is on a scale of 1 to 100. Getting a good mix of 50+ and -50 terms will benefit your overall search optimization strategy. Using a combination of long-tail keywords (more than 3 words) and shorter, broad keywords that your exact target audience are using, you can create some very targeted optimized results. While these highly targeted keywords may have low search volume, you can be sure that the audience using them is definitely searching for a B2B organization like yours; long-tail keywords convert 2X better than their associated broad keywords. 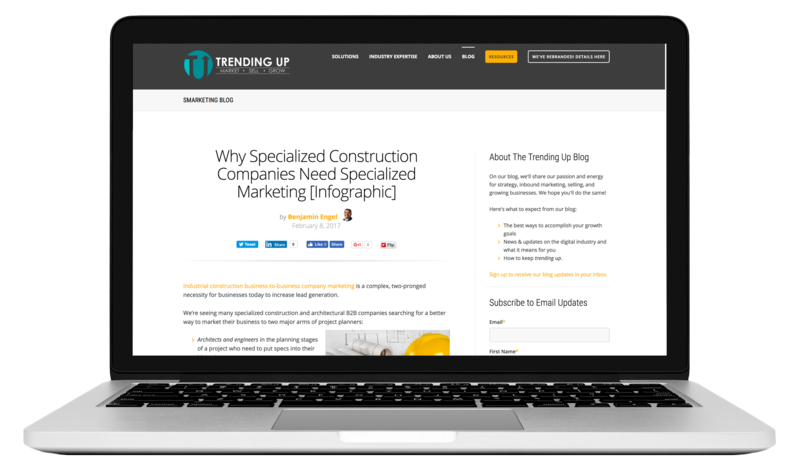 Our content team started a new campaign targeting specialized construction companies using a mix of long-tail keyword search engine optimization and inbound marketing content on our site. Next, we wrote an educational blog post about targeted marketing for specialized construction. It was well-researched, contained some of the keywords we identified, and had a compelling title. We also created an infographic to go with the post and highlight the data we uncovered. Three other supporting blog posts, linking back to this initial post, were also published in consecutive weeks. Within 45 days, our blog post appeared in the first spot on Google’s search engine results page for the keywords targeted marketing for specialized construction and inbound marketing for B2B construction companies and remains there today. The people clicking through on the post are highly targeted and engaged prospects. Elle is a marketing coordinator at a national seller of machinery in the US. She struggles to meet the demand for lead generation through traditional marketing tactics, and the website she manages doesn’t provide quality leads to the sales team. While their company has a large presence at multiple trade shows throughout the year, she lacks the ability to track any prospects or leads that come from those efforts in order to follow up on them. Based on research using Google’s customer journey tool, it was clear that there are a number of online research channels that her target audience uses prior to making a purchase, including organic search, referral sites, social media, and email. After conducting a website audit, we aligned Elle’s B2B manufacturing website with the new goals in mind, implementing better SEO tactics, establishing a blog, and creating some high-quality educational anchor pages for their top solutions. Using fresh, educational content and strategic search engine optimization, we were able to place this manufacturer’s content squarely on page 1 for related Google searches for her target industry campaign. Using social media and email channels to share the content helped grow visits from those channels. Between those channels and organic growth, traffic to the website rapidly increased by almost 70% within 6 months. Converting site visitors through engaging downloadable content was the next goal of the campaign. We created and launched a Planning Production Tool with the goal of gaining qualified leads. The tactic worked; 8 new qualified leads came through the site within the first few months of launching this small campaign. Once the leads were in the system, Elle needed a way to ensure that each lead received follow-up. We established a series of automated marketing emails that keep her manufacturing company front-and-center in the minds of these targeted leads, and it has helped to gather additional information from these buyers while also keeping engagement up.